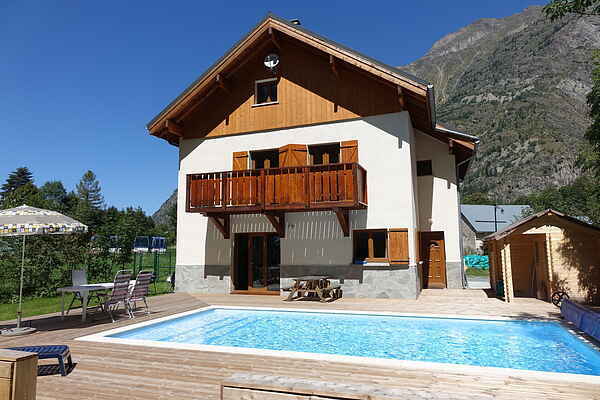 Thie detached chalet Marianne with its lovely heated outdoor swimming pool (open from May to September) is located in the valley in the Massif de l'Oisans, 9 km from Bourg d'Oisans and the foot of the Alpe d'Huez. The chalet features 4 spacious bedrooms and 2 bathrooms, a very spacious living room, open plan kitchen, terrace and large garden and its own parking. There is also a separate garage for the safe parking of bicycles and skis. You'll be staying in a beautiful location at the edge of one of the largest nature reserves in France, "Les Ecrins", close by Les Deux Alpes and Alpe d'Huez. This is a fantastic for lovers of high mountains. Come and enjoy a magnificent view of the mountains of the Pardcdes Ecrins and Les Deux Alpes. The chalet is located in the picturesque French mountain village of La Danchère. The gondola to Les Deux Alpes is 3 kilometres away and Alpe d'Huez is 13 km away. The chalet is ideally situated for skiing and cycling enthusiasts near Les Deux Alpes, Alpe d'Huez or Serre Chevalier. Take your bike for a climb through the famous mountain pass of the Tour de France. It's also a perfect base for long walks in the fantastic nature reserve of the Parc national des Erins.